And here's a link to related story in the local newspaper Newspaper Kaleva story with a video of kids arriving at school. Since the beginning of the year 2015 it has been legal to ride a bicycle without any lights! Yes, really! It's true! Now it is enough to have a headlight or some other light strapped onto the rider, when before the light had to be attached TO THE BIKE. That means I've lost dozens of chances to feel smug and superior to those headlight wearing lawbreakers. It's not enough to remove the snow! Well, it would be if the first vehicle on the street would be the snow plow tractor or truck also equipped with magical snow sucker to get the last flake off the ground. But they're not. The snow gets packed into ice under the wheels (and feet) and each time it snows the ice layers get thicker and thicker. And this packing happens only where the wheels run, leaving the other areas of the street unpacked. And those unpacked areas are easy to move by plow, wind and later in the spring, by melting. Which means there will be little hills of ice and everybody will be trying to stay on top of the hills and not fall. The clip in the previous post started from top of an overpass. The road below is a bit dug in, but the bridge still gives a nice boost going downhill! I started wondering how the drivers below will like piles of snow and chunks of ice raining down on them when the snow plows clean the overpass, as there almost certainly will be some going trough the railing... then I noticed the "chicken wire" behind the railing in the upper picture. Ok, one inch pieces of ice are not so dangerous. There's still some room to plow more snow to the side before you need to get a wheel loader (or a tractor with a front loader) to remove it. An ice scupture? An ice mushroom? It will scare the careless mobilist who parks his car here and crashes into it. Although more likely, the snow plow got it first. Wet snow will turn into ice when cars drive over it, causing un-ruts (whatever is the opposite of a rut :-) of ice which are hard to remove by a regular snow plow (you need a scraper for that). These unruts, covered by snow were the reason for several crashes while the snow was still coming (I guess there were some pileups too). At least that's what the drivers claimed. And I think I read about a car flipping over a few days later when the weather got colder and the salted main roads started to freeze. Salt does not prevent freezing, it just makes it happen in colder temperature. 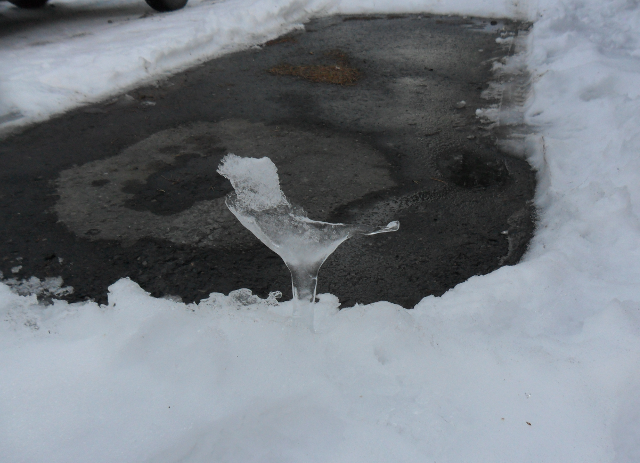 So one might get that partially frozen, black ice road surface at -20C that we had a few days ago.